_SOUTH OXHEY HAS RETURNED TO WAR TIME BLACKOUT CONDITIONS. 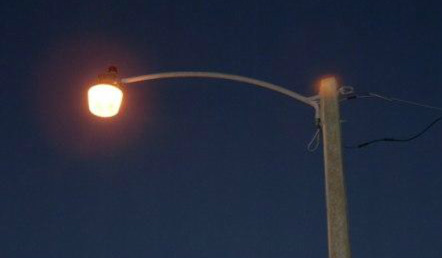 Conservative Hertfordshire County Council has engaged contractors to alter the timing mechanism of 80% or more of South Oxhey’s street lights. They now go out at midnight and go back on at 6.00 am. Only streets that have poor traffic conditions, or that are in areas of high crime, have been spared. _ Many South Oxhey residents are surprised when it happens, and even assume at first it is a power cut. Once they discover that it is a deliberate action by the County Council, many are angered. In recent weeks we have spoken to many unhappy residents. In particular, residents who need to travel to or from work at night are concerned about their safety. Residents with limited mobility are, similarly, concerned that they are now prevented from being out of their homes for six hours of the day, so worried are they about negotiating pot holes and slippery pavements in the pitch black. The County Council says this is a cost-cutting exercise. But the ridiculous thing is, it is actually costing taxpayers £4.6 million, and will take at least 4 years to start saving a penny. In the meantime, accidents and crime will soar. At least 70% of South Oxhey's street lights are being switched off. Once switched to part night lighting, the timing mechanism cannot be adjusted without repeating the entire, costly process. So any changes that are needed in response to increased crime or accidents, will mean a call-out for a repair crew. The County Council will only consider switching a light back on again if the police advise it to do so. Click on the image below to be taken to an online petition that is being signed by residents across the county, who are demanding to have their street lighting switched back on. "I did not know the street lights were going to be turned off," Ms Carly Thomas of Piltdown Road told us. "I cut my foot on broken glass coming home, because the lights were turned off." How is the blackout affecting you?